Results for this study are based on telephone interviews conducted by Social Science Research Solutions (SSRS), an independent research company, among a nationally representative sample of 2,012 Latino respondents ages 16 and older,43 from Aug. 5 to Sept. 16, 2009. Of those respondents, 1,002 were native born (excluding Puerto Rico) and 1,008 were foreign born (including Puerto Rico). For results based on the total sample, one can say with 95% confidence that the error attributable to sampling is plus or minus 3.7 percentage points for total respondents. We conducted interviews with 1,240 respondents ages 16 to 25 and 772 respondents ages 26 and older. The margin of error for respondents ages 16 to 25 is plus or minus 4.6 percentage points, and the margin of error for respondents ages 26 and older is 4.8 percentage points. Taken together, there were 711 native-born Hispanics ages 16 to 25, 529 foreign-born Hispanics ages 16 to 25, 291 native-born Hispanics ages 26 and older and 479 foreign-born Hispanics ages 26 and older. The margin of error for native-born youths (ages 16 to 25) is plus or minus 6.2 percentage points; for foreign-born youths, it is plus or minus 6.5 percentage points. For second-generation youths, the margin of error is plus or minus 7.6 percentage points, and for third-generation youths, the margin of error is plus or minus 11.1 percentage points. For native-born respondents ages 26 and older, the margin of error is plus or minus 8.1 percentage points, and for foreign-born respondents ages 26 and older, it is plus or minus 5.9 percentage points. For this survey, SSRS maintained a staff of Spanish-speaking interviewers who, when contacting a household, were able to offer respondents the option of completing the survey in Spanish or English. A total of 1,128 respondents were surveyed in English, 842 respondents were interviewed in Spanish and42 were interviewed equally in both languages. Any male or female of Latino origin or descent was eligible to complete the survey. According to government statistics from the National Health Interview Survey (NHIS) during the last six months of 2008, 25% of Hispanic adults lived in households reachable only by cell phone. Adults who are cell-only are very different demographically from those reachable on a landline. In particular, they tend to be younger, less likely to be married or have children, or to own a home. To address the growing number of Hispanic households in the U.S. that are reachable only by cell phone, the study included interviews from both landline (n=1,360) and cell phone (n=652) sample frames. Both sample frames were stratified via a disproportionate stratified design. All telephone exchanges in the contiguous 48 states were divided into groups, or strata, based on their concentration of Latino households. For the landline frame, the sample was also run against InfoUSA and other listed databases, and then scrubbed against known Latino surnames. Any “hits” were subdivided into a surname stratum, with all other sample being put into other RDD strata. 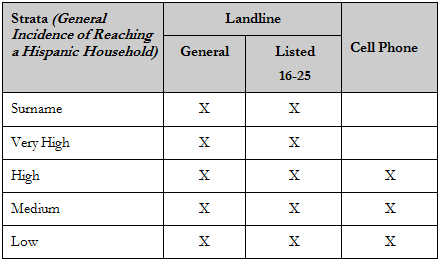 The landline sample was divided into 10 mutually exclusive strata: five strata denoted by the likely incidence of Hispanic residence, each divided into listed and unlisted samples. Listed samples refer to phone numbers that could be matched with available lists, indicating the presence of persons between the age of 16 and 25 in the household. This design was intended to allow oversampling in high-incidence Hispanic areas and targeting of households that were likely to include persons 16 to 25 years of age, while assuring that all Latino households in the U.S. had a known probability of selection. Because incidence in the low stratum was anticipated to be extremely low, an alternative sampling method was employed, randomly selecting from a pool of thousands of households previously interviewed in SSRS’s omnibus Excel survey that were known to be Latino households in general (for the general component), or Latino households with 16- to 25-year-olds present (for the listed component). SSRS applied quotas within each stratum to ensure the overrepresentation of Latinos between the ages of 16 and 25. Furthermore, to accumulate a sufficient number of responses from Latinos ages 16 and 17; this age group was disproportionately selected over all other age groups. The sample was corrected to reflect the percentage that is cell-only (25%), landline-only (21%), or reachable by either a landline or a cell phone (53%), based upon estimates for Hispanics from the 2008 National Health Interview Survey. Finally, the data were put through a post-stratification sample balancing routine. The post-stratification weighting utilized national 2007 estimates from the Census Bureau’s Current Population Survey, March Supplement, on gender, education, age, region, foreign/native-born status, year of entry into the U.S. and Hispanic heritage. Post-stratification was conducted separately for the 16- to 25-year-old group and the 26 and older age group, to increase the accuracy of the population distributions within these age categories. The post-stratified age groups were then merged in proportion to their population distribution.